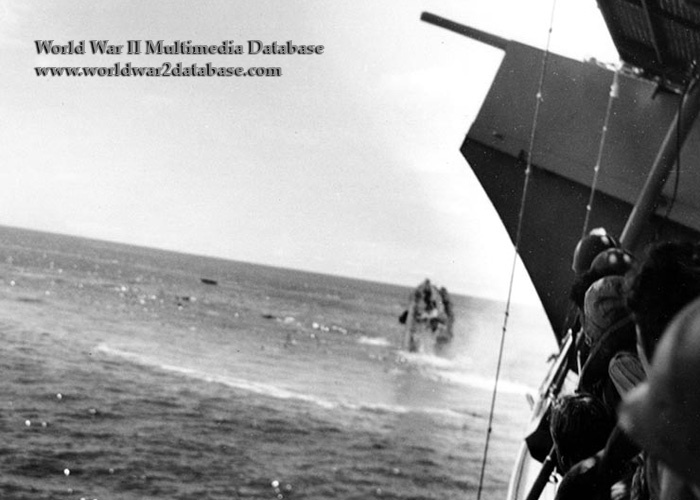 Stunned sailors on USS Yorktown (CV-5) watch helplessly as USS Hammann (DD-412) sinks stern last. USS Hammann, a Sims class destroyer, was assisting the damaged Yorktown with power for her bilge pumps, lights and firefighting. The salvage crew had partially corrected Yorktown's list, cut away or thrown overboard equipment to lighten the ship, and made temporary repairs. Imperial Japanese Navy submarine I-168 spent nine hours avoiding the destroyer screen and attaining firing position. Letting loose four torpedoes, one hit Hammann amidships, breaking her back. Yorktown and Hammann separated; Yorktown was hit as well. She sank within four minutes, her after depth charges exploding, killing many in the water. Of a total of 13 officers and 228 men on board, two officers were known dead and seven missing; twenty-five crewmen were known dead and forty-seven missing. Most of the missing were incinerated by the explosion. The survivors returned to Pearl Harbor aboard the escorting destroyers.